During World War II, German troops laid almost two million landmines along Denmark’s west coast. In a cruel twist of fate, after the war, Danish authorities conscripted over 2,000 German Prisoners of War to clear out these minefields in violation of the Geneva Conventions; over half of those POWs lost their lives or limbs. The 2015 Danish-German co-production Land of Mine dramatizes this little-known part of post-WWII history. Its English title is a darkly humorous play on words that hints at its main themes — what it means to go “home”, and well, the effects of landmines. The ensuing story is dark, yes, but anything except humorous. At the film’s center are a group of young German POWs and a grizzled Danish Sergeant, Carl Rasmussen, assigned to supervise them. Barely adults and completely inexperienced with mines, the Germans must clear a beach of 45,000 of them. After that, Rasmussen promises them, they can go home. Naive pitiable youths, a stern sergeant who’s supposed to be their enemy, a literal minefield– Land of Mine takes full advantage of this perfect storm of dramatic ingredients. I’m beginning to consider avoiding any mine-related movies after watching both Land of Mine and the British Afghan War film Kajaki; the suspense is way too much to handle. With such a large set of young characters and a storyline that promotes empathy and character development, in Land of Mine it is simultaneously nail-biting and devastating to always know in the back of your mind that anyone could be the next to go. Even in times of rest and reflection during the film, you’re still in “alert mode”. Land of Mine is one of those rare movies that keeps your complete attention for its entire length. You could also say that the film also humanizes the Axis side of WWII. 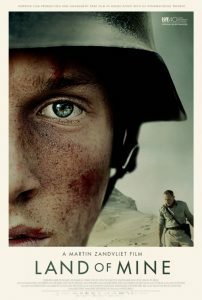 The Germans in Land of Mine are depicted in a sympathetic light–they’re just boys, after all, not even fully matured. They, too, are the victims, caught up in a struggle with inhuman, impersonal forces that have no regard for nationality or age. On account of its more limited physical scope (a single beach), a deeper emphasis on a smaller set of characters, and its Danish setting (though not unscathed, Denmark experienced less direct German brutality than other occupied countries such as those on the Eastern Front), it’s also less controversial piece than other Axis-centered WWII productions like the German miniseries Generation War. Happy blue skies and rainbows. Tonally, the film is also rather muted and melancholy. The Danish landscape it’s set in, with its gray-tinged skies, expansive flat grasslands, and beautifully barren coastline, contributes heavily towards this feeling. Aerial shots, sweeping but not too ambitious, occasionally pop up alongside landscape stills or limpid longshots, creating a beautifully desolate image that complements the storyline. Concise, poignant, and captivating, Land of Mine offers a novel yet intuitive glimpse of a war we see quite often on film. With the obvious bloody implications that come from putting young boys into a minefield; it’s not for the faint of heart. But if you can stomach the suspense and brutality, it’s definitely worth a watch. 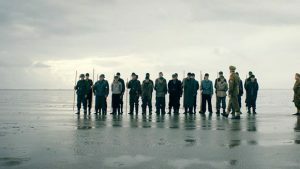 Land of Mine (Danish: Unter Sandet)–Denmark/Germany. Dialog in Danish and German. Directed by Martin Pieter Zandvliet. First released December 2015. Running time 1hr 40min. Starring Roland Møller, Mikkel Følsgaard, Louis Hofmann, Joel Basman, and Leon Seidel.